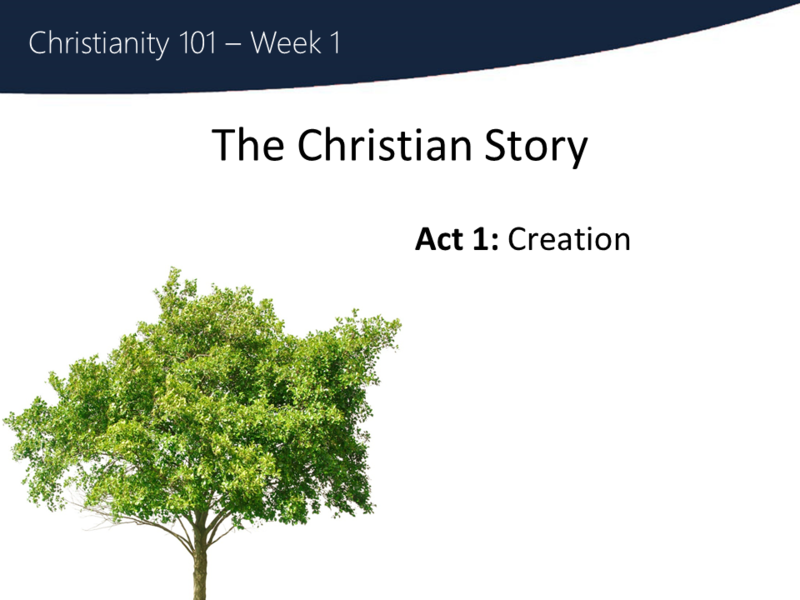 We begin an overview of the Christian story in six acts with Act 1, Creation. Question: Have you ever felt you were made for a purpose? Have you ever found it, or fulfilled it? Why or why not? Through this course, I hope you will find a story to live by…a story that answers the big questions of life.There are lots of stories out there, and lots of them claim to answer life’s big questions, but with varying degrees of success.The Christian story answers life’s big questions in a unique and powerful way. I have experienced that myself! So we’ll look at that story now. Today I’ll summarize it, then each week is going to focus on one or two aspects of this story in depth. Imagine it as a play with six acts…with God as the writer and director. The Director writes, or creates a masterpiece – a work of art that reflects who he is in deep and powerful ways. He entrusts the script to his actors, the human race…gives them everything they need to follow the script. He does that with the intent that they will play their parts, taking their cues from him as director, and following his script. This is how the story of creation began…God creating the world and us, as a beloved masterpiece. We were created to have a close, intimate, personal connection with God…in the Bible this is obvious, in the story of the Garden of Eden where humans and God were made to walk together. Another way to say it: Created to love God, be loved by him. Not like mushy romantic love, or even friendship, but rather like the best, most perfect parent could unconditionally love their child. A love none of us has ever known…no matter how good our parents were, or were not, they are all measured against this one relationship. God, like that perfect parent, expressed his love in many ways, one of them by providing all material, emotional, spiritual needs through his creation. All the children (we) needed to do was enjoy God’s love and care, not try to be anything but what we were made to be. This is the way the world was meant to be: God, Humans, Natural World all living in harmony under God’s care. This is the story that begins the Bible, as it talks about a garden where humans and God lived together, with all our needs provided for as long as God was in control. Or to use our play illustration: God wrote a script, and we were each made to play our part according to it. God would be the director, who partnered with us, the actors with a part to play in his masterpiece. Have you ever felt you were made for a purpose? Have you ever found it, or fulfilled it? Why or why not?